Begin your journey in Cape Town where you’ll delight in the breath-taking natural beauty, rich cultural heritage and world-famous Winelands. At Sabi Sand Private Game Reserve you’ll encounter big game and pristine wilderness before your stay in The Victoria Falls. Victoria Falls is the widest curtain of falling water on earth, a UNESCO World Heritage Site, and one of only seven natural wonders on the planet. On arrival into Cape Town you will be met and transferred via private transfer to your hotel. The rest of the day is at your leisure to explore the city. Cape Town has many diverse attractions – beautiful mountains and beaches, trendy coffee shops and fine restaurants, fascinating historical sites and contemporary cultures. Overnight at Dock House Boutique Hotel or similiar. Cape Town City Tour. After departing the hotel early, we head for Table Mountain. Enjoy the crisp air and clear visibility as you reach the summit (weather permitting). Our guide will point out the highlights of one of the world's most famous views. After the decent, the tour continues on, through the "Bo-Kaap", also known as the Malay quarter. The architecture in this area is typical of what Cape Town was like 200 years ago. The imposing Castle of Good Hope, fortress built to protect the early Dutch Settlers and the SA Museum is also on the itinerary. Overnight at Dock House Boutique Hotel or similiar. Full day Cape Peninsula tour. Embark on a spectacular journey around the Cape Peninsula taking in all the highlights and breathtaking beauty of this world-renowned region. Travel through historic suburbs, charming fishing villages and awesome viewpoints on your way to Cape Point, where it was said that the mighty Atlantic and Indian Oceans meet in harmony. Overnight at Dock House Boutique Hotel or similiar. Cape Winelands Tour. A marvellous way to explore the Cape Winelands, this trip hits the highlights of this spectacular region. Travelling through verdant valleys and around craggy peaks, the landscape is as much a star as the fine wines and delicious foods that you’ll savour. Travel to Stellenbosch, the historic heart of the country’s wine region with an elegant mix of 18-century Cape Dutch, Georgian and Victorian buildings. After a brief tour you will enjoy a wine tasting at a fine wine estate. Move on to a second wine tasting (time permitting) before returning to Cape Town. Overnight at Dock House Boutique Hotel or similiar. Explore the area on morning and late afternoon game drives in the care of experienced rangers and trackers. Encounter the Big 5 as well as wild dog and cheetah. 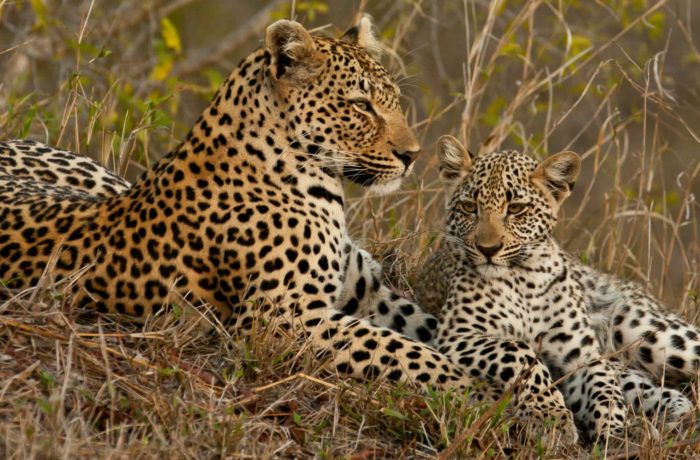 Leopards are the main attraction in the Sabi area, which boasts an unrivalled record for the regularity and quality of sightings. Overnight at Lions Sands River Lodge or similiar. Departing at sunrise for your first game drive makes the bountiful breakfast on return to the lodge very welcome. A guided nature walk provides a refreshingly intimate perspective on the bush. African afternoons are designed for utter relaxation: lounge at the pool, soak up the views of the Sabie River from your suite or indulge your senses at the spa. Overnight at Lions Sands River Lodge or simliar. Marvel at the Victoria Falls on a guided tour that shows you the sights and gives you brilliant views from the best vantage points, as well as all fascinating facts about the history, formation, fauna and flora of this UNESCO World Heritage Site. Later you will relax upstream on a sunset cruise on the Zambezi River with plenty of game viewing opportunities as elephant, giraffe and antelope make their way to the river’s edge. Overnight at Royal Livingstone Hotel or similiar. Today you will be driven back to Livingstone airport to connect with your outbound flight. Splendors of Southern Africa - 11 days Our Tailor made itinerary of 10 days is an excellent blend of city and safari that enables you to experience the top attractions that Cape Town has to offer, enjoy an unforgettable luxury safari in the Kruger National Park and end in the world famous Victoria Falls. Our specialists are looking forward to hearing from you so that we can custom design a tour to your individual specifications.